All Bus Code of Conduct letters must be signed and returned by Monday, April 22, 2019. These letters were originally sent home April 1st and were sent again within the last 10 days. Letters are being sent home today with all students who have not returned their signed Bus Code of Conduct. To avoid loss of bus privileges please return this letter by Monday, April 22, 2019. 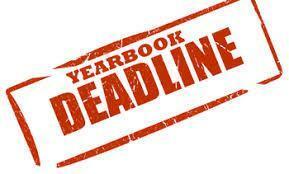 Attention parents and students: The absolute last day to order a KISD yearbook is Friday, April 26th. You will not be able to purchase a book after this date! You can purchase online by clicking the headline for the link to order online, or to print and fill out the form and return to the front office of your child's campus. Seniors, there are a few remaining pages of senior ads left to fill. These pages will be sold on a first come first serve basis. Please see Ms. York if you are interested in purchasing a senior ad. Notice is hereby given that the polling place listed below will be open on May 4, 2019, from 7:00 a.m. to 7:00 p.m., for voting in a Regular Election for Place 5, Place 6 and Place 7. All places serve three terms. In the spirit of school safety, we want to inform you that we are implementing a new Bus Code of Conduct for the remainder of the 2018-2019 school year. The district is implementing these changes to ensure that our students are safe on all of our buses because safety continues to be our number one priority in Kemp ISD. Training on the new Bus Code of Conduct with our student bus riders will be provided at the campuses on the following days. 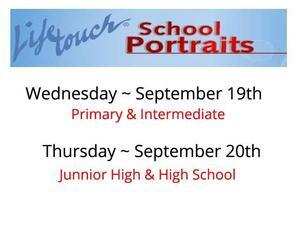 Families of students are welcome and encouraged to attend the training as well. Please see the attached Bus Code of Conduct that will be implemented for the remainder of this school year. Contact your campus administrators if you have any questions or concerns regarding these changes. Our job as adults is to keep our students safe. This will be accomplished by all of us working together. 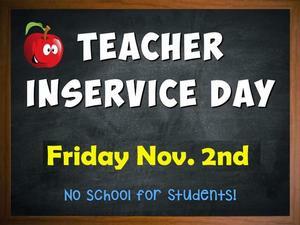 Lastly and importantly, school transportation services are a privilege. 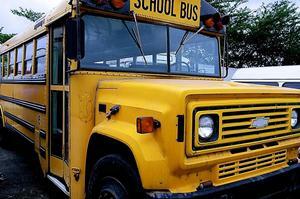 Students not acting in accordance with our revised Bus Code of Conduct, are subject to losing bus privileges. We appreciate your cooperation and thank you for your help! Please Note Parents: Your signature is required acknowledging that you have received a copy of the revised Bus Code of Conduct and your signed parental form must be on file within three weeks of receiving the letter. If the signature is not received after three weeks then it will result in a loss of bus privileges. This goes for ALL students, all students at some point or another ride a bus whether it is to go home or attend a field trip or for sporting events. All signatures must be on file by April 22nd in order to continue to ride the bus. 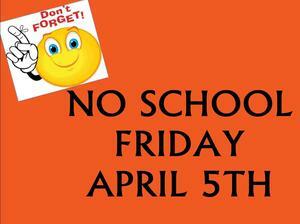 There will be no school, Friday, April 19th. 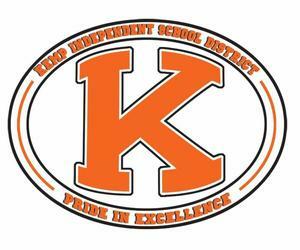 Kemp ISD is moving to a new phone system on Wednesday, March 20th. The expected switch is scheduled between 11:00 AM and 1:00 PM on Wednesday. 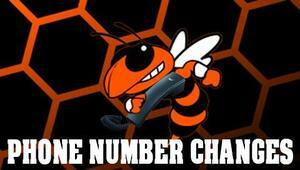 At that time, most of the numbers used to dial into the district will be changing. Please click the headline to see a list of the new numbers that should be used following the transition taking place on the 20th. 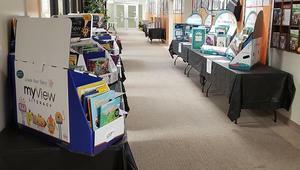 The K-8 English Adoption materials are available for public review at the KISD Admin Offices. Click the headline for more information. Kemp Intermediate School Student Council would like to invite any current or retired First Responders or Military members to a luncheon! "About Raise Your Hand for Texas" – The future of Texas – our economy, communities, and citizenry – depends on how well we prepare our students today. All students deserve a level playing field and equal access to a quality public education. We believe our public schools represent our greatest hope for educating and preparing all 5+ million Texas students for the future. 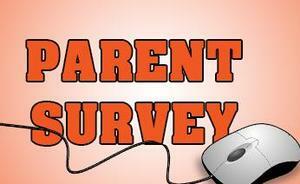 Parents, we are very interested in getting your feedback in our annual Kemp ISD Parent Survey. 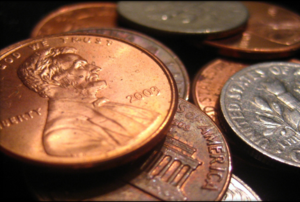 We use this data to help us evaluate our progress and identify opportunities for improvement. Thank you so much for your input. 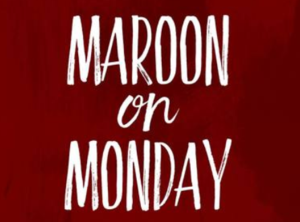 Kemp ISD will be joining other East Texas schools on Monday the 28th by wearing Maroon on Monday. Our hearts and prayers are with Athens ISD. Please read the letter attached to the headline regarding changes to student meals in the District. education services. We hope to give you some tools, activities, and ideas that will help you with your child’s development. The sessions will be at the Kemp Education Service Center (KESC) at 204 West 17th Street, from 4-5 PM in the afternoon. 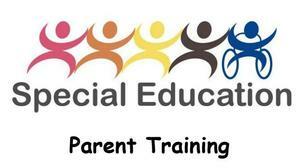 or call the Special Education Office at 903-498-1391. Click the headline to read the attached flyer. Don't miss out on this opportunity to get in the know about Livingtree. One of our own, Pam Freeman, has been diagnosed with cancer. Please read the flyer to learn more about how we plan to let Pam know that she is not fighting this battle on her own. February 18,2019, classes will resume on Tuesday at regular schedule. 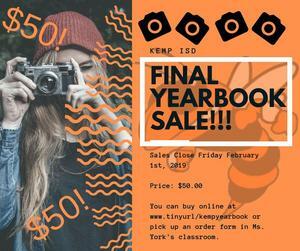 Last Chance to Buy A 2018-2019 Kemp ISD Yearbook! It's the last day to buy your 2018-2019 yearbook this year! 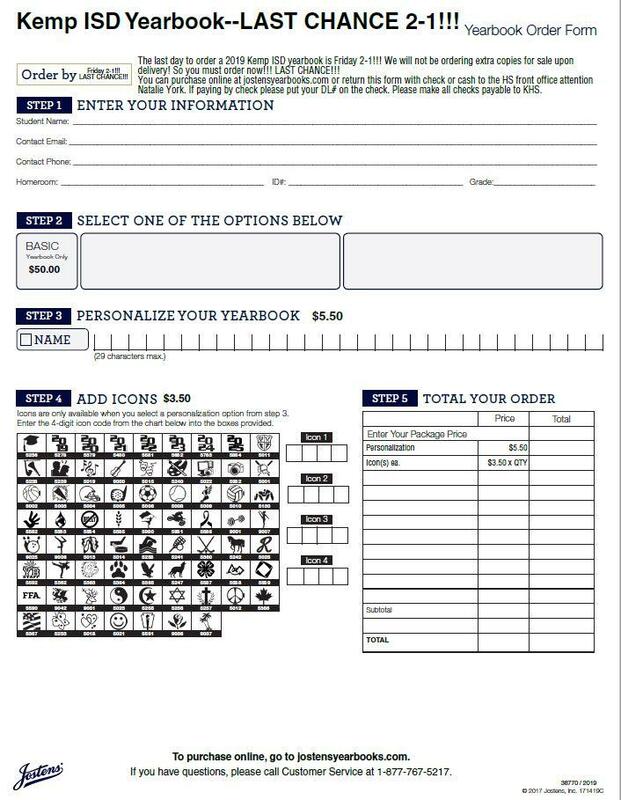 Please fill out the order form or go to http://www.tinyurl.com/kempyearbook to order! 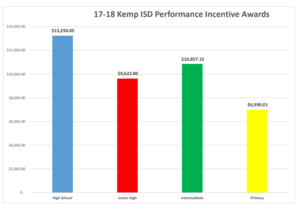 The Kemp Incentive Pay for Teachers page has been updated with 2017-2018 Incentive Award information. Please click the heading to read more. This page is also easily accessible through the Employee drop-down menu on the homepage. Parent Portal will be back online at 8:00 AM. tomorrow, August 8th. Thanks for your patience while some processes take place on the back-end to prepare for the 18-19 school year. Thursday night, at a special board meeting, the Kemp ISD Board of Trustees named, Dr. Lisa A. Gonzales, as superintendent of Kemp schools. Dr. Gonzales has 34 years of experience in education, most recently as the Superintendent of Schools at Odem-Edroy ISD where she has served for the last 7 years. She has previously held a variety of educational roles such as the Assistant Superintendent of Curriculum and Instruction (Bowie ISD), Director of Special Education (Wylie ISD and Hillsboro ISD), Principal (Hillsboro ISD), and various elementary and secondary teaching positions. District personnel are excited about the wealth of experience that Dr. Gonzales can contribute, and look forward to new ideas coupled with the exciting things that are already happening at Kemp ISD. 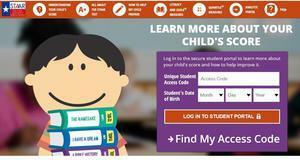 STAAR Scores are now available. 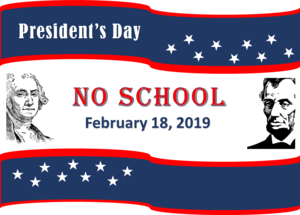 There will be no school on Monday, January 21, 2019. All campuses and offices will be closed. School will resume on Tuesday, January 22, 2019, at regular school hours. 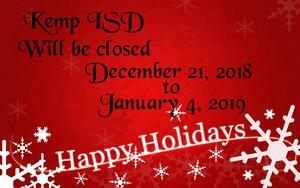 Kemp ISD will be closed from December 21, 2018, to January 4, 2019. Have a safe and Happy Holidays. 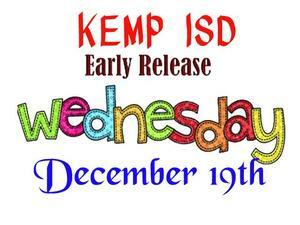 Kemp ISD will release early, Wednesday, December 19th. 1/2 Day Staff Development on Wednesday and full day Staff Development on Thursday, December 20th. Glitzmas in the Park has been moved to the Highschool Cafeteria, Saturday, Dec. 8th 10 am - 2 pm. Stingerette's host The 3rd Annual Glitzmas in the Park. If you would like to be a Vendor, click the headline for an application. 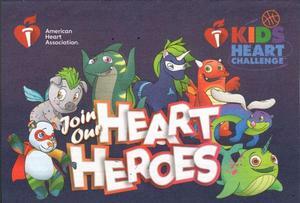 Intermediate students will be participating in the Kids Heart Challenge (previously Jump Rope for Heart) November 7th - December 7th. It is a great fundraiser for our students to take part in, as well as learning about a healthy, active lifestyle. 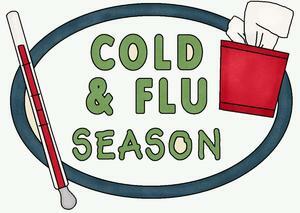 Click the headline for more information and website to register. 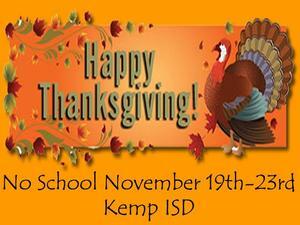 No school, November 19th-23rd, school returns on November 26th, regular school hours. Holiday Food Drive benefiting the Annual Christmas Party for Community Kids. Calling all Veterans and Active Duty Military Personnel and their families. Kemp ISD is extending an invitation to join us on Monday, November 12, 2018, for their 1st Annual Community Veterans Day Celebration. 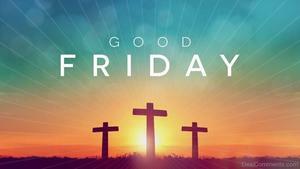 All district students and community will come together at 9:30 am at KHS Jacket Stadium for this Special Day. This event is meant as a means of Honoring our Country’s Veterans. Please contact Angie Ellis at Kemp ISD (903-498-1312) if you are a Veteran or Active Military Personnel who would like to attend. 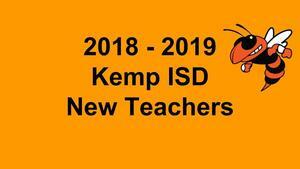 Parents of current Kemp ISD students must complete registration for the 18-19 school year ONLINE. [You must have a parent portal account to complete the online registration process.] Click the headline for more information. Please click the headline to read more information. Red Ribbon Week ~ The purpose of Red Ribbon Week is to present a visible commitment to living a safe, healthy, and drug-free life. The campaign is designed to create awareness concerning the problems related to the use of tobacco, alcohol, and other drugs and to support the decision to live a drug-free lifestyle. High School, Intermediate and Primary Campuses has a dress-up theme for each day, Click the headline for the district list of days. Click the headline for more details. Click headline for more information. 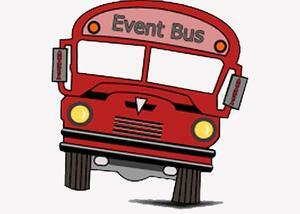 Shuttle buses will be provided for Homecoming game. 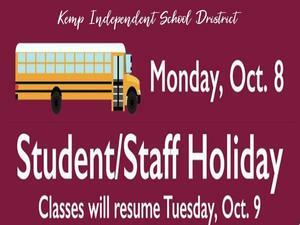 Kemp ISD will provide shuttle buses for the Friday night Homecoming game. Shuttle buses will run from the Junior High and Intermediate parking lots starting at 5:30 pm. Shuttle buses will continue to run throughout the game and will stop making runs approximately 30 minutes after the game is completed. October 12, 2018, 8 am to 9:30 am. 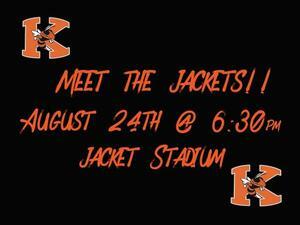 Student ages, 4-14 are invited to spend a fun-filled evening with the Stingerettes! Click the headline for the schedule of activities, information and registration packet. No School ~ October 8, 2018. The New School year is upon us, please join us in welcoming our new teachers for the school year. Click the headline to see who they are! The Junior Varsity and Junior High games vs. Commerce will not be played this week. Any plans for a make-up game will be announced soon. 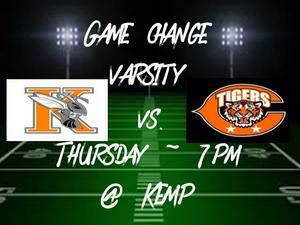 The Varsity game vs. Commerce has been moved to Thursday, Sept. 20th @ 7 p.m. at home. 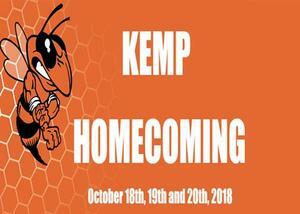 The pep rally will take place on Thursday at 2:45 PM at Kemp High School. 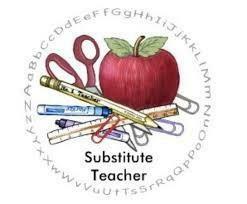 Kemp Independent School District will be conducting a substitute training class on Wednesday, January 23, 2019, at 9:00 am in the School Board Room of the Administration Building. Click the Headline for detailed information. Kemp Education Foundation Make? Click the headline to watch a 5-minute video and find out.